Ea O Ka Aina: Arctic Methane "May be apocalyptic"
SUBHEAD: Increases in methane emissions are likely, and catastrophic emissions cannot be ruled out. Image above: Likely methane off-gassing from the breakdown of carbon in sediments below the lake, keeps the water from freezing in spots, outside Fairbanks, Alaska, October 21, 2011. From original article. Photo by Josh Haner. A scientific study published in the prestigious journal Palaeoworld in December issued a dire -- and possibly prophetic -- warning, though it garnered little attention in the media. "Global warming triggered by the massive release of carbon dioxide may be catastrophic," reads the study's abstract. "But the release of methane from hydrate may be apocalyptic." The study, titled "Methane Hydrate: Killer Cause of Earth's Greatest Mass Extinction," highlights the fact that the most significant variable in the Permian Mass Extinction event, which occurred 250 million years ago and annihilated 90 percent of all the species on the planet, was methane hydrate. In the wake of that mass extinction event, less than 5 percent of the animal species in the seas lived, and less than one-third of the large land animal species made it. Nearly all the trees died. Methane hydrate, according to the US Office of Fossil Energy, "is a cage-like lattice of ice inside of which are trapped molecules of methane, the chief constituent of natural gas." While there is not a scientific consensus around the cause of the Permian Mass Extinction, it is widely believed that massive volcanism along the Siberian Traps in Russia led to tremendous amounts of CO2 being added to the atmosphere. This then created enough warming to cause the sudden release of methane from the Arctic sea floor, which kicked off a runaway greenhouse effect that led to sea-level increase, de-oxygenation, major oceanic circulation shifts and increased acidification of the oceans, as well as worldwide aridity on land. The scenario that humans have created by way of the industrial growth society is already mimicking these eventualities, which are certain to worsen. "The end Permian holds an important lesson for humanity regarding the issue it faces today with greenhouse gas emissions, global warming, and climate change," the abstract of the recent study concludes. As the global CO2 concentration continues to climb each year, the threat of even more abrupt methane additions continues to escalate along with it. The methane hydrate situation has, for years now, been referred to as the Arctic Methane Time Bomb, and as been studied intensely. "significant increases in methane emissions are likely, and catastrophic emissions cannot be ruled out.… The risk of rapid increase in [methane] emissions is real." A 2011 study of the Eastern Siberian Arctic Shelf (ESAS), conducted by more than 20 Arctic experts and published in the Proceedings of the Russian Academy of Sciences, concluded that the shelf was already a powerful supplier of methane to the atmosphere. The conclusion of this study stated that the methane concentration in the atmosphere was at levels capable of causing "a considerable and even catastrophic warming on the Earth." 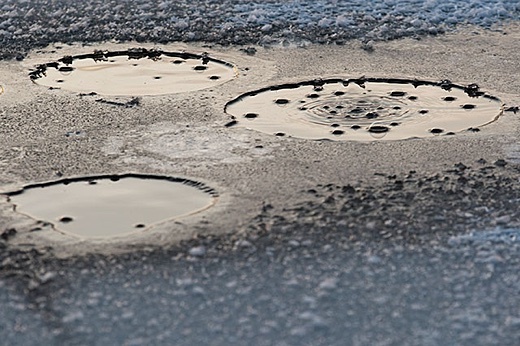 Scientists have been warning us for a number of years about the dire consequences of methane hydrates in the Arctic, and how the methane being released poses a potentially disastrous threat to the planet. There has even been a study showing that methane released in the Arctic could trigger "catastrophic climate change" that would cost the global economy $60 trillion. Of course, that level of planetary heating would likely extinguish most life on the planet, so whatever the economic costs might be would be irrelevant. "Highly Possible at Any Time"
The ESAS is the largest ice shelf in the world, encompassing more than 2 million square kilometers, or 8 percent of the world's total area of continental shelf. In 2015, Truthout spoke with Natalia Shakhova, a research associate professor at the University of Alaska, Fairbanks' International Arctic Research Center, about the ESAS's methane emissions. Shakhova warned that a 50-gigaton -- that is, 50-billion-ton -- "burp" of methane from thawing Arctic permafrost beneath the ESAS is "highly possible at any time." This, Shakhova said, means that methane releases from decaying frozen hydrates could result in emission rates that "could change in order of magnitude in a matter of minutes," and that there would be nothing "smooth, gradual or controlled" about it. She described it as a "kind of a release [that] is like the unsealing of an over-pressurized pipeline." In other words, we could be looking at non-linear releases of methane in amounts that are difficult to fathom. A study published in the prestigious journal Nature in July 2013 confirmed what Shakhova had been warning us about for years: A 50-gigaton "burp" of methane from thawing Arctic permafrost beneath the East Siberian sea is highly possible. The UK's Met Office considers the 50-gigaton release "plausible," and in a paper on the subject added, "That may cause ∼12-times increase of modern atmospheric methane burden, with consequent catastrophic greenhouse warming."